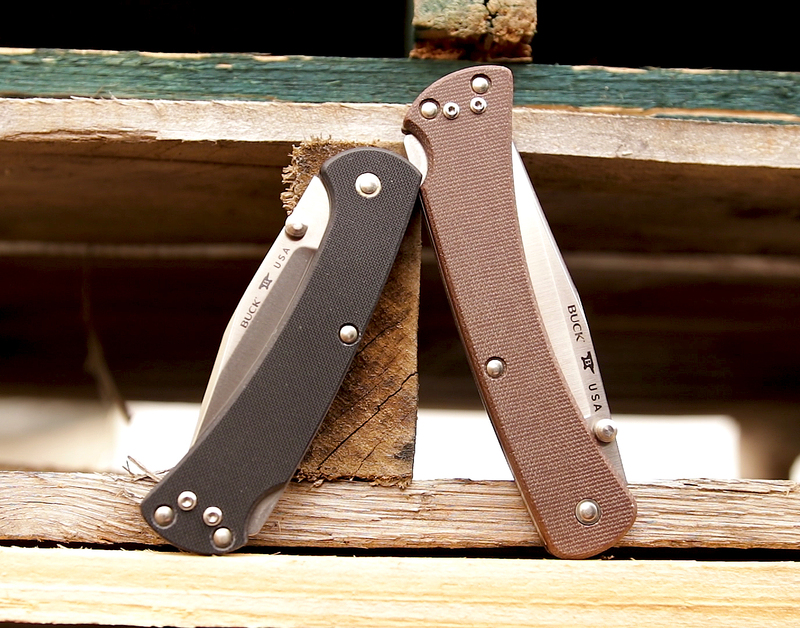 The big news from Buck last year was a comprehensive update of the Buck 110 Folding Hunter and Buck 112 Ranger. Dubbed the 110 Slim and 112 Slim, these new knives are thinner, lightweight, and the Pro versions sport high-performance blade steel and handle material. As such, the natural competition for these models has shifted, and we think the Spyderco Endura and Delica are now the perfect rivals. Don’t believe us? After the jump, we’ll go through these models feature by feature to see how they stack up. We’ll start with a look at what these knives have in common, to see why they are fit to go head to head with each other, and we will gradually see where differences emerge. Let’s start with the price. 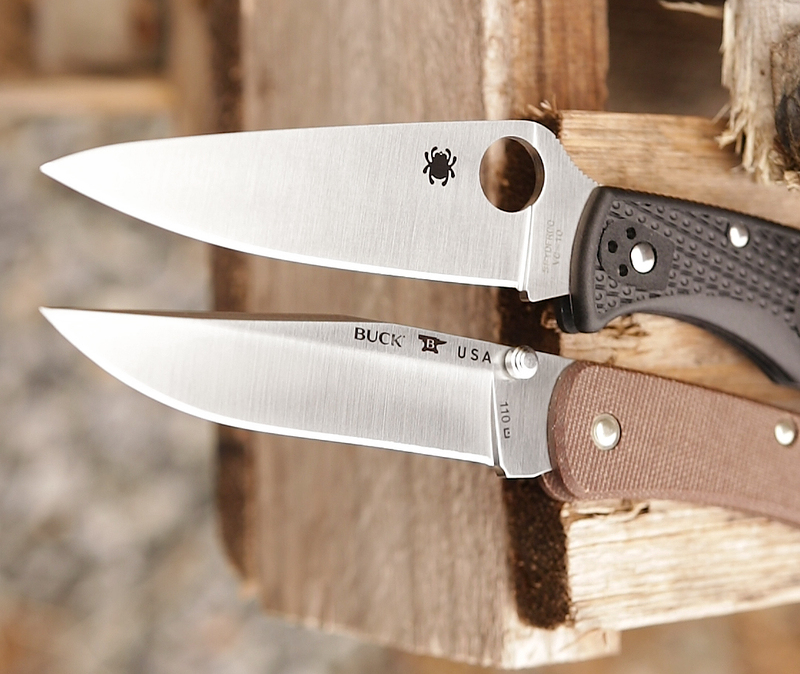 Although Buck’s 110 and 112 Slim Select models start much lower than the Spyderco Endura/Delica, the Slim Pro models are within a few dollars of their Spyderco counterparts. Hold the new 110 Slim Pro up against a Spyderco Endura, or the 112 Slim Pro against the Delica, and it is uncanny how close they are in both blade length and handle length. Effectively the same, we’ll have to dive a little deeper to see where they diverge. All of these knives feature the tried and true lockback mechanism, an industry standard that works well for right or left-handed users. It is here, however, that we start to see the two designs diverge. The Buck’s lockback is disengaged from the rear, while the Spyderco lock release is mounted mid-spine. The Spydercos also feature a David-Boye dent, a concave cutout on the lock release that is designed to help prevent accidental disengagement when gripping the handle tightly. Spyderco offers VG-10 stainless steel on their base Enduras and Delicas, a very respectable steel with good edge holding and nice, stainless properties. It is easy to maintain and will take a very fine edge. The Bucks, on the other hand, are equipped with S30V, a modern particle steel that will be able to hold an edge longer than VG-10. The tradeoff? 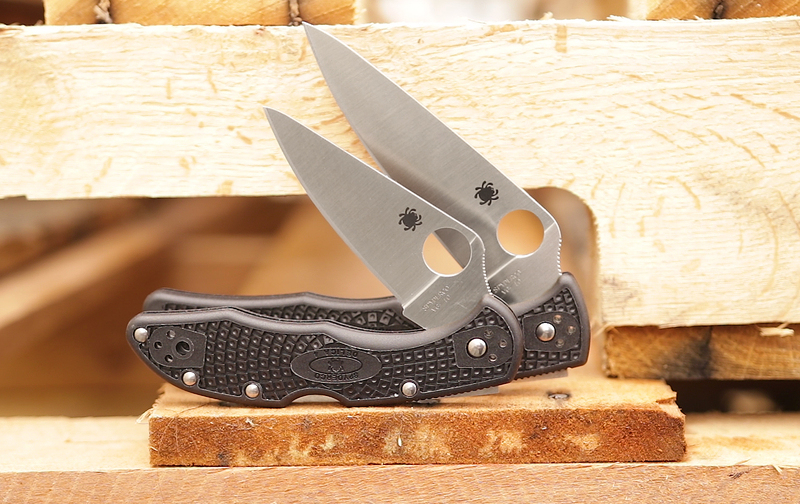 While you won’t have to sharpen as often, it won’t be quite as easy to hone as the Spyderco blades. Of course, there are upgrade options for the Spyderco that will allow for even greater edge retention (including our Knife Center exclusives with laminated HAP40 blade steel) but the prices will go up accordingly and no longer compete directly with the Buck Slim Pro models. The Buck blades feature a clip point profile with a hollow grind that cuts very well. The deep concave clip point of the classic iterations has been traded out for a straight clip point, making the Slim Pro models even more versatile for modern uses and less focused on skinning or game processing. 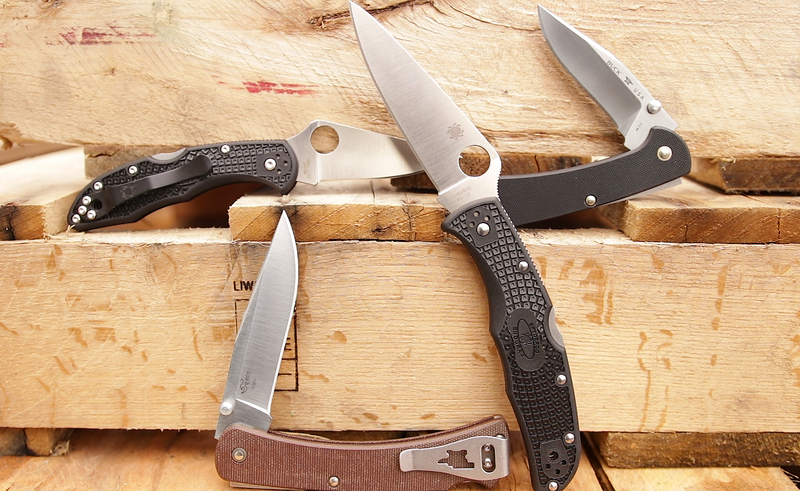 The Spyderco, however, brings choices to the table that you just won’t find from the Bucks. Their standard blade can be had with either a full flat grind or a hollow saber grind. If you are unhappy with the blade shape, you can also get the Spyderco models with a Wharncliffe profile. Additionally, the availability of the blades in plain edge and partially or fully serrated edges mean the Endura and Delica models cover a broader range of use scenarios than the Buck knives. Spyderco’s bi-directional textured FRN handles are known for their grip. Providing plenty of traction and strength without a ton of weight, the Endura and Delica are great options for wet or grimy environs. Buck definitely takes the crown for more premium handles with the Slim Pro update. They are available with micarta or G10 scales with only minimal texturing. Although they aren’t as aggressively grippy as the Spydercos, they will likely be a little bit kinder to your pockets over time. They can slide in and out a bit more smoothly since there are fewer opportunities for the knife to snag on the fabric. 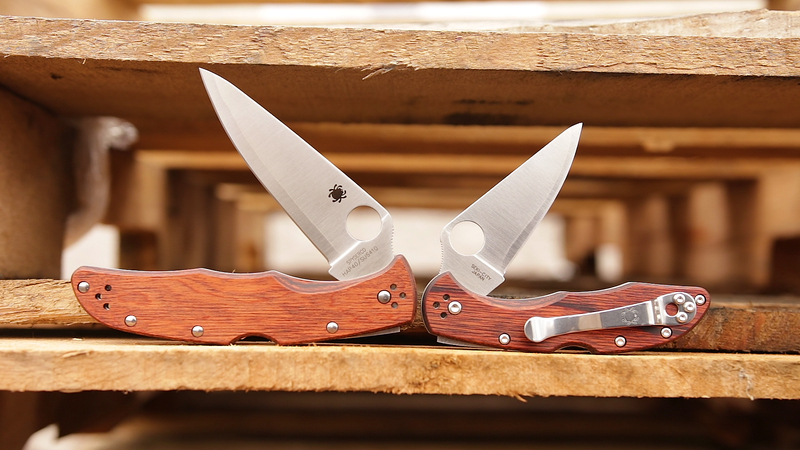 Of course, as with other things, for more dollars, Spyderco has upgraded options to choose from that sport everything from stainless steel handles to the aforementioned Knife Center exclusives with stabilized Pakkawood. The Buck’s facilitate one-handed opening with the addition of dual thumb studs. They sit behind the plunge line so won’t get in the way when cutting through material. The Spyderco’s, with their signature round hole, open a little more smoothly. This is in part due to the point of rotation being farther forward on the blade, allowing you to exert more leverage. The pivot itself is also adjustable with a Torx bit, whereas the Buck’s pivots are non-adjustable. 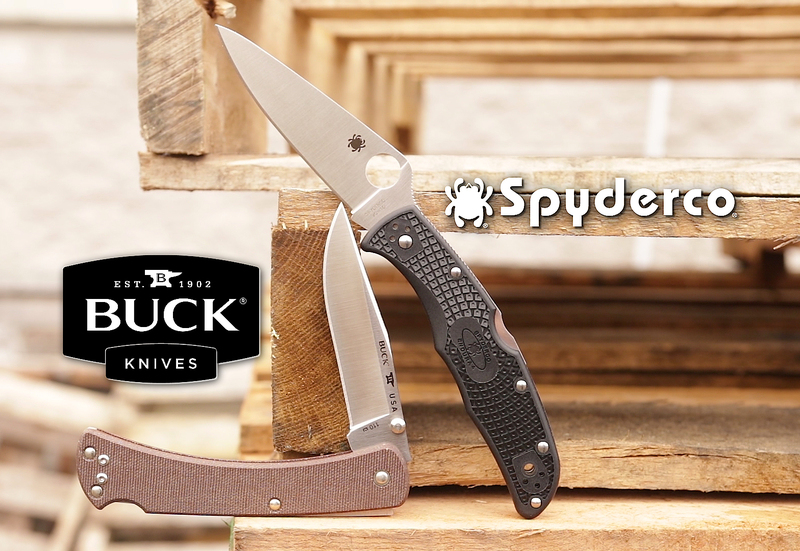 When it comes to carrying these knives, we see some significant differences between the Spyderco and Buck offerings. If anything is clear by now, the Endura and Delica love to give the end user as many options as possible. To that end, they come equipped with a four-position pocket clip that allows you to carry the knife tip-up or tip-down on either side of the body. They also come with a lanyard hole, allowing for accessories to be attached, either for style or to make it easier to remove the knife from your pocket. The Bucks do not get a lanyard hole, and the pocket clip allows for tip-up carry only, although it still is reversible for left or right-hand carry. It also sits lower in the pocket with less handle sticking out than the Spydercos. For most of us who will be using these blades for day to day utility, they really are interchangeable, but there are a few specific use cases where they set themselves apart from each other. If you plan to go hunting with your folder, the Buck DNA is undeniable, and it would be an easy choice. The Spydercos, with their increased traction and integrated thumb ramp, will transition better to tactical uses than the Bucks will. But, for most of us, and most EDC uses, either knife would be an excellent choice. It is almost impossible to declare a winner, so that is where you come in. Make sure to comment below, telling us which design you prefer and why. Shop all Spyderco Endura, Spyderco Delica, Buck 110 Slim Pro Folding Hunter and Buck 112 Slim Pro Ranger knives.